2-3. Starting at the bottom of the egg, begin pinning sequins into the egg. I created new holes rather than using the existing holes. It is best to stagger the sequins, as it makes for a more tiered/pinecone look rather than a fish scale look. 4. Once you have reached the top, tie your yarn in a knot with a bow. Push a pin through the top of the bow. 5. Push the bow and pin through the center of a sequin to finish off the top. You're all done! So pretty! 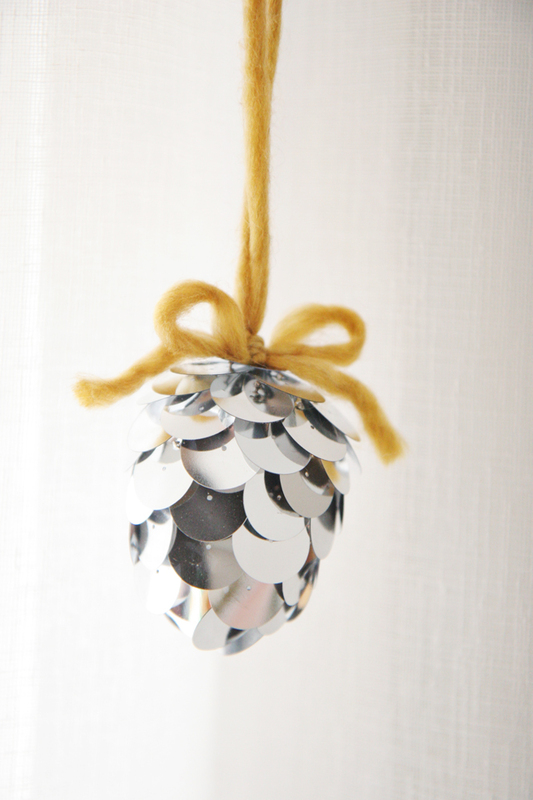 I love DIY christmas ornaments. So unique. Very cute! I might have to try this one! Love this idea, we have a new cat who is very destructive so I can't use my lovely vintage baubles, I've been making pom poms for the tree and will be giving these a try so my collection of non-breakable decorations grows! So cute and so simple! I just SQUEALED ABOUT THIS. How cute are they?? just the right amount of sparkle, I bet the Christmas tree lights look amazing off of it. Oh my goodness, this is absolutely adorable!! Love it! I love christmas ornament traditions. My mom always made an ornament for each of her three kids every year that represented a milestone from that year (e.g. learning how to walk) -- I plan to continue the tradition when I have children...thanks for this cute DIY! This is lovely! I can't stop making ornaments. I was thinking of you since I attempted to create little owl ornaments, take a look... now I can't stop! I love this! so lovely! These are adorable! I love this idea! So pretty and so unique. I love this idea. Katie, those are incredible. I love that you have a tradition with your daughter, it'll be nice once your little one can join in as well. Looking forward to trying my hand at making some ornaments this year as well. PS: Stop by my blog if you like cats, flowers, and thrift store adventures. I just did a "What's in my Bag" post, and started my holiday gift guide! super cute! i may have to try making these! That is adorable and seemingly fuss-free! So cute. I think I'll try it myself. Cooool. :D Looks like something my mom would've made growing up in the 1970s. Cutee! where can you get those silver beads? I'm surprised at how much that egg shape turns out to look like a pinecone!I would have NEVER thought of that! I moved to Florida from Maine, known as the Pine Tree State. However, I've never seen more pine trees in my life than we have here in the panhandle of FL - LOL Looking forward to making these in different colors and perhaps tying them together into a swag to hang in my front windows. Thank you for sharing! What an awesome ornament!! I love how it must catch and reflect light. It does look a little hard for younger kids. I will be doing an ornament project with the kids I babysit that is perfect for you get kids. Look for it later this week at www.kraftykatieblog.com. 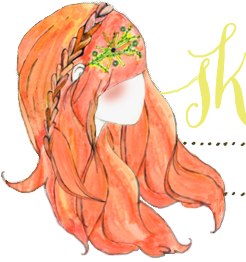 I always love reading about your creations. sweet! 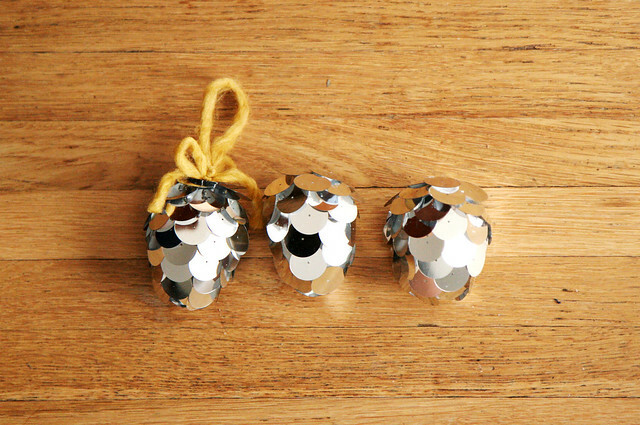 reminds me of the sequined ornaments we would make back in the 70s! though those sometimes ended up a mishmash mess. Love how simple and sweet these are. Thank you! The popularity of designer cheap omega watches has reached its highest peak. People are still buying Coach and Gucci bags even though there is a global popular christmas giftsrecession. Well, the seemingly overwhelming prices of designer discount rolex watches, leather bags and shoulder bags may not be that dramatically overwhelming at all. There are a number of truly great qualities catier bangles of designer handbags that outshine the high prices of such bags. The incredible workmanship womens jackets and beautiful design of fashion handbags are what most people see.